How to play iTunes M4V movies on Moto G6, G6 Plus and G6 Play? 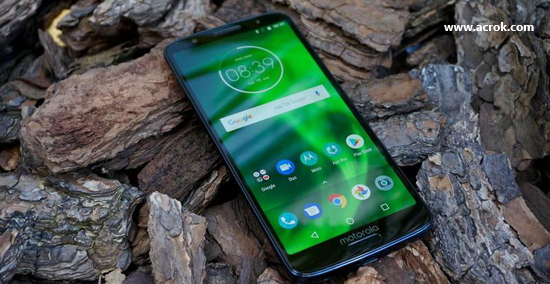 This latest budget phone launched alongside the Moto G6 Plus and Moto G6 Play at a global unveiling in Sao Paolo, Brazil and it looks a bit special. The new Moto G6 has a similar, somewhat quintessential Motorola design seen on previous generations. The Moto G6 Plus is the largest model and is also the thinnest, with a thickness of 8 millimeters. The combination of glass with curves on the sides, the reduced bezels and thinness is something that enhances the user experience. Of course, the software performs well and comes running the most current version of Android, Oreo 8.0.
iTunes has become one of the biggest resources when it comes to finding new media and set your own music or video library among others. However, a big limitation that comes to with it is that most of these files you will have, even if you purchased them, will not be that much available when it comes to plaing on Android devices. This is due to DRM encryption applied to such files by iTunes. If you are Motorola Moto G6, Moto G6 Plus or Moto G6 Play user, you will be in trouble. You can't transfer and play purchased iTunes M4V movies on Moto G6/Plus/Play directly. That's why many people are looking for ways to convert iTunes M4V files to H.264 for playing on Moto G6, Galaxy S9 Plus, HTC U11, LG V30, Xperia XZ2, Google Pixel 2, etc. If you plan to get iTunes movies on your Moto G6, Moto G6 Plus or Moto G6 Play, the easiest way to do it is through DRM Removal that will allow you to create these digital copies right on your computer in the easiest fashion. Which program can do this job? Acrok M4VGO (Windows Version | Mac Version) is your best choice.With shis iTunes to Moto G6 Converter, you can convert iTunes movies and music to Moto G6, Moto G6 Plus, Moto G6 Play supported formats. How to play iTunes M4V movies on Moto G6/Plus/Play? After you install iTunes to Moto G6 Converter, just follow the three short steps below to start sharing your newly-freed video to anyone, on virtually any device. Tip: To rip and convert Blu-ray movies for Moto G6 or other portable device, Acrok Video Converter Ultimate can give you a hand. 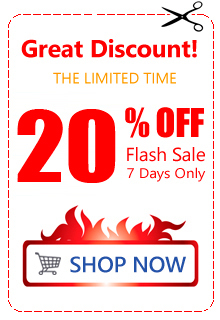 It's the best Blu-ray ripping software which can rip Blu-ray movies to any video format. 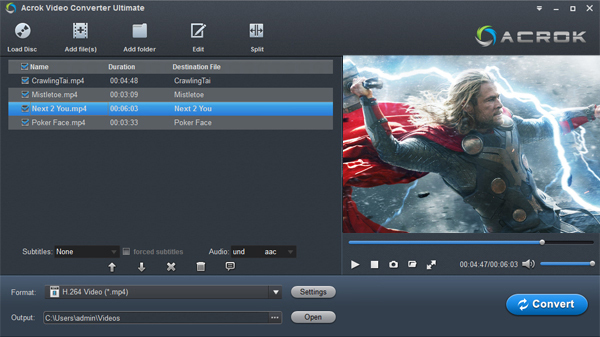 Click the "Add File" button at the top left to browse your computer's folders and select the purchased M4V movies you want, you can import multiple files at once thanks to batch conversion. Click "Format" bar to choose output format for your Moto smartphone. Here, you need to move your mouse to "Common Video" category then choose "H.264 Video (*.mp4)". This profile can help you get the original resolution video. Tip: For converting iTunes M4A music for Moto G6, Moto G6 Play or Moto G6 Play, you can select MP3 format in "Common Audio" category. After a short setup, click the "Convert" button to begin the iTunes movies or music to Moto G6/Plus/Play best playback format conversion process. After conversion, you can click "Open" button to get the converted iTunes movies or music. Connect your smartphone to computer then transfer the media to Moto G6/Plus/Play for playing freely. Now, you can get iTunes on your Moto smartphone. MobileGo's powerful multi-files manager makes it easier than ever to download, manage, import & export your music, photos and videos with the push of a button, in real time, all in one location. De-duplicate contacts, switch devices, manage your growing app collection, backup & restore and even send messages from your desktop. It's all possible with MobileGo! MobileGo gives you powerful music management, letting you transfer music to(for Android only) and from computer, import iTunes playlists, set your favorite song as ringtone, delete unwanted music in batches, and download music from websites. How to transfer iTunes music to Moto device via MobileGO? Step 2. Go to Media Management section, and choose Import iTunes Playlists. MobileGo detects all playlists in iTunes and shows them in the pop-up Import iTunes Playlists Window. Step 3. 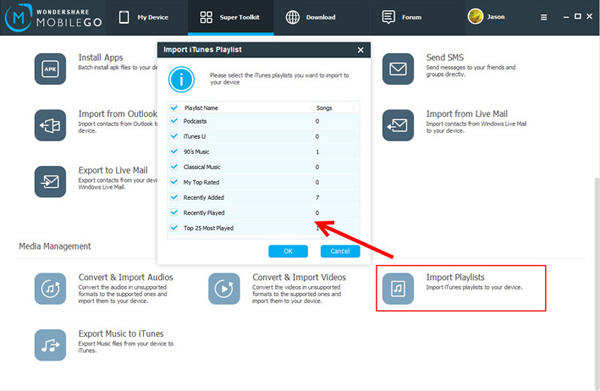 Check the playlists you want to import to your smartphone. Then, go to the lower right corner and click OK. Step 4. MobileGo begins to import playlists from iTunes to your Moto smartphone. In the whole process, keep your device connected. What a wonderful program to have in your toolbox. Comes in very handy and very reliable. I can get iTunes on Android easily.